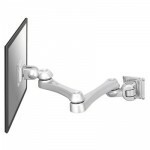 The FPMA-W930 is a LCD/TFT wall mount with 4 swivel points for screens up to 24" (60 cm). This NewStar LCD/TFT wall mount, model FPMA-W930, allows you to mount a flatscreen to a wall. The mount has 6 movements which offer maximum flexibility. This model with 3 pivots allows users to swing, tilt and turn the flatscreen for maximum efficiency and comfort. Arm lenght: 19-62 cm. This wall mount easily connects to the back of each flatscreen due to the VESA hole pattern. This wall mount can hold screens up to 12 kg and has a VESA 75x75 & 100x100 hole pattern. Ideal to mount screens up to 24" to the wall. Perfect for TFT monitors and small LCD televisions!